i-Road concept vehicle at Toyota Australia's Corporate Headquarters (concept vehicle shown). A90 GR Supra Concept at Toyota Australia's Corporate Headquarters (concept vehicle shown). 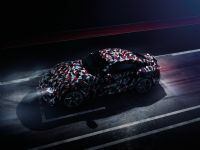 A production prototype of the all-new Supra will make its debut at the Goodwood Festival of Speed (Toyota prototype shown. Not available for purchase). Toyota aims to inspire children to love cars.